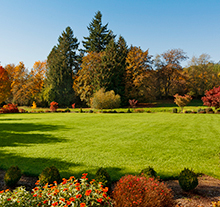 Your lawn experiences heavy use in the summer, and now it is ready to settle things down and prepare for winter. Fall is prime time to repair any summer damage and to clean up so that your lawn is ready to enjoy come next spring. If you do not have trees around your property and leaf clean up to do, you may assume that fall lawn care is not essential. In fact, the more preparation you do during this season, the better your lawn will look and be for your next season. Fall is all about cooler temperatures, leaves falling, and the occasional rainfall. Luckily, with the favourable temperatures, you can get outside and do more yard work without dealing with the heat and humidity. Mowing: Your lawn does not grow as quickly in the fall, but you still need to mow it. When fall comes to an end, you can drop the blade as low as you can so that the sun reaches the crown of your grass blades. Aerate: Fall is prime time for aerating your lawn. Aeration allows oxygen, water, and fertilizer to reach the roots of your grass. While you could aerate yourself, it is faster and more affordable to hire someone to come out and do the job for you. Rake Up: Leaves can be an annoying chore, but something you cannot ignore. Fallen leaves must be raked up as quickly as possible. Leaving them in the yard allows them to soak up moisture, create a mat, and suffocate your lawn. Furthermore, they are a breeding ground for fungal diseases – which are detrimental to your lawn. 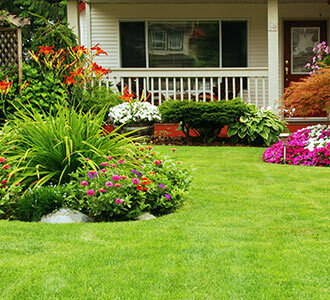 Fertilizer: Your lawn needs fertilizer treatments throughout the year. In the fall, you are preparing the roots for winter and protecting them from freezing temperatures. Late fall applications use different balances of nitrogen, phosphorous, and potassium, as compared to other seasons. If you have a lawn maintenance plan, like the service from Greenbloom, your fall fertilizer treatment will be done for you. Seed: When your lawn is dense, it is protected from frost and weeds. Therefore, fall is an ideal time to fill in those bald spots and overseed the turf. In the fall, the ground is warm enough, moisture plentiful, and you do not have scorching temperatures harming delicate new grass blades. You have plenty to deal with in the fall. To help with your fall maintenance, cleanups, and fertilizing treatments, hire the team at Greenbloom. Our lawn care specialists offer maintenance plans that include seasonal weed and fertilizer treatments. We can also help you seed your lawn for a denser turf over the winter season. Our packages can be customized to suit your lawn’s needs, including aeration and seeding packages, and more. Learn more about our maintenance services and packages by contacting the team at Greenbloom online. You can also call us at 647-500-5263.